From aerial surveillance to cancer detection, mid-wavelength infrared (MWIR) radiation has a wide range of applications. And as the uses for high-sensitivity, high-resolution imaging continue to expand, MWIR sources are becoming more attractive. Currently, commercial technologies for MWIR detection, such as indium antimonide (InSb) and mercury-cadmium-telluride (MCT), can only operate at cryogenic temperatures in order to reduce thermal and electrical noise. In a search for alternatives, a team of researchers at Northwestern University’s Center for Quantum Devices (CQD) has incorporated new materials to develop detectors that can work at room temperature. Depending on its use, infrared radiation is divided into several wavelength segments. MWIR have a radiation range between 3-5 microns; cameras able to see in this wavelength are capable of passive infrared imaging. 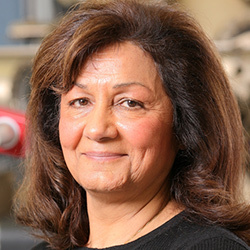 Razeghi and her group developed an indium arsenide/gallium antimonide (InAs/GaSb) type II superlattice that demonstrated high-resolution MWIR images while operating at high temperatures. The new technique was particularly successful at obtaining infrared images of the human body, which has potential for vascular imaging and disease detection. Supported by DARPA, the Army Research Laboratory, Air Force Research Laboratory, and NASA, the team’s findings were reported in paper in the January 1 issue of Optics Letters, the journal of the Optical Society of America.